The near-by Tunnel of Trees, following the Lake Michigan shoreline, is one of country’s most notable stretches of scenic highway. North of Petoskey is the Crooked Lake/Alanson area located along US-31. Near the intersection of West Conway Road and US-31 is the township park, located along the shores of Crooked Lake. A sandy beach and picnic area make this a perfect afternoon stop for lunch in the sun. Just north, the Oden State Fish Hatchery is not only educational, but both interesting and for everyone. See local fish in the hatchery raised in a controlled environment as well as in the stream. Travel further along US-31 to Alanson and visit the antique shops and rustic retailers in the small village of Alanson. Be sure to visit the Dutch Oven Bakery for their famous cinnamon bread. Crooked Lake is approximately a 10 minute drive from Bay Inn of Petoskey. Head north from Petoskey along M-119 through the famous Tunnel of Trees. This state historic high­way snakes its way along the twists and turns of the Lake Michigan Shoreline. Along the way, visit Pond Hill Farm just minutes north of Harbor Springs for organic produce, canned goods, and free hayrides. Continue north and you won’t miss Good Hart, a small tourist village complete with the 1934 Good Hart General Store. For a picnic along the beach, stop in at the general store for a sandwich or salad and then turn right onto Lamkin Drive just north of the store. Make a sharp right at the bottom of the hill and you’ll find yourself at the township park. Seven miles north of Good Hart is Cross Village, home to Leg’s Inn, featuring authentic Polish cuisine and live music throughout the summer. The Tunnel of Trees makes a great day trip from Bay Inn of Petoskey. Follow US-31 north all the way until it merges with I-75 and you’ll run right into Mackinaw City. Mackinaw City is your portal for daily ferry trips to beautiful Mackinac Island, a tiny island bordered by Lakes Michigan and Huron where fudge is abundant, natural beauty rich, and history preserved in the grandest of fashions. You’ll soon notice that you’ve stepped back in time to a place where motorized vehicles are not permitted. Enjoy the peace and tranquility only found on Mackinac Island. Guests of Bay Inn of Petoskey can expect a 40 minute drive to Mackinaw City. Bay Inn of Petoskey is located just 35 miles south of the mighty Mackinac Bridge, the “bridge that couldn’t be built” and one of the world’s longest suspension bridges. Take a drive north and cross this work of magnificent engineering skill. 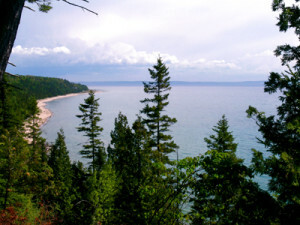 The 5-mile+ crossing will take you to a world of adventure and exploration – Michigan’s upper Peninsula. Cross the bridge and return back home, or continue on into the beautiful, pristine landscape of the U.P. Pictured Rocks State Park, Copper Country, Tahquamenon Falls, the Lake Superious Shoreline, and much more await your exploration.